Check out our Amazon Wish List for information about items needed for all locations! And don’t forget to select KC Pet Project as your AmazonSmile charity at http://smile.amazon.com/. Did you know that you can shop on some of your favorite sites like Petco, Amazon and Target and part of your purchase will be donated to KCPP? It’s so easy! KC Pet Project is proud to be a Partner for Pets! BISSELL and LostPetUSA.net have teamed up to help organizations like ours raise money, and now you can help too! When you purchase pet products on bissell.com and enter the code ADOPT at checkout, a portion of your purchase will be donated to our organization! These limited-edition doggie tags have been specially designed for man’s best friend by TIVOL in partnership with KC Pet Project. The price of each tag includes the engraving of your pet’s first name and phone number. 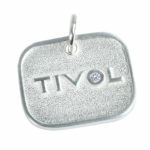 * For each dog tag purchased, TIVOL will donate $20 toward KC Pet Project. Purchase yours online today by clicking here or visit their Country Club Plaza or Hawthorne Plaza locations. If you’ve never tried Chewy.com before here’s your chance. Once you’ve made a purchase and qualify (first time customer, one per household), our organization gets a donation point, worth $20! At the end of the month Chewy will send KCPP a donation check for our referrals. Help KC Pet Project earn FREE Fresh Step Cat Litter for the cats in our shelter. Join the Paw Points rewards program and see how you can help improve the lives of our shelter cats.